Contribute to the Continuation of SerialEM! SerialEM was originally developed with grant funding from NIH. It is now being maintained and developed with funding that comes from users, directly or indirectly, in order to maximize the time that can be spent on writing code and documentation instead of grant proposals. Basic bug support: Resolution of issues apparently arising from SerialEM bugs ($275 non-profit, $550 commercial). Priority bug support: Rapid resolution of issues apparently arising from SerialEM bugs ($550 non-profit, $1100 commercial). Priority software support: Consultation on and resolution of issues arising from configuration and calibration problems as well as SerialEM bugs ($1100 non-profit, $2200 commercial). Application support: In addition to software support, advice and consultation on how to get the most out of SerialEM for your applications ($2200 non-profit, $4400 commercial). What happens if you do not contribute? Although the first three options represent the kind of support that we provide routinely, payment for this support is voluntary. We still answer questions and deal with problems from non-paying users, but may take longer to do so. Questions may be posted to the discussion list first. Why is it important to contribute? Even though there are other sources of support for SerialEM continuation and development, user contributions are important both financially and because they are not tied to specific developments and represent the general user interest. What does this mean for the future of SerialEM? This is not a move toward commercialization. We intend to keep the program freely available. Click Here to see more details and contribute by check or purchase order. Click Here to see more details and pay now by credit card. SerialEM is a program that can acquire a variety of data from electron microscopes: tilt series for electron tomography, large image areas for 3-D reconstruction from serial sections, and images for reconstruction of macromolecules by single-particle methods. The main focus of the program is automated tilt series acquisition. For this, it uses an approach based on prediction of specimen position during the tilt series from the position at previous tilts. It does not count on the microscope or the specimen being particularly well-behaved, so unless a prediction appears reliable, it falls back to measuring and adjusting defocus and/or specimen position when necessary. With this method, it achieves both robustness and speed. For example, a 2Kx2K, 1 degree tilt series can be acquired in about 20-25 minutes with a four-port readout CCD camera. Mastronarde, D.N. 2005. 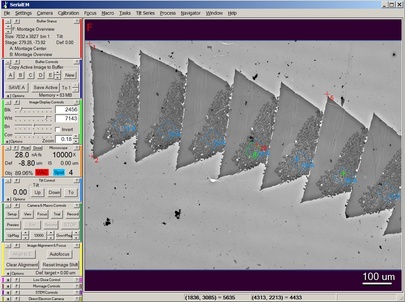 Automated electron microscope tomography using robust prediction of specimen movements. J. Struct. Biol. 152:36-51. Mastronarde, D.N. 2003. SerialEM: A program for automated tilt series acquisition on Tecnai microscopes using prediction of specimen position. Microscopy and Microanalysis Vol. 9, Suppl. 2, 1182CD. Click image for full-sized view. The program provides a flexible interface for user intervention. When acquiring a tilt series, the user can stop if necessary, adjust position or focus, and even conveniently back up to a previous tilt angle and replace the stored data from that point onward. Other kinds of acquisition also provide an ability to stop and restart. There is a low dose mode, in which focusing and tracking are done in a separate area to minimize exposure of the area being recorded. The program allows one to set up the magnification and illumination independently for up to 4 different areas, where these settings are invoked simply by taking a picture of the particular area. SerialEM can automatically acquire a montage of overlapping frames, and it can acquire a tilt series of such montaged images. The images are written to a single file that can be viewed immediately in 3dmod. A montaged tilt series can be processed with the eTomo interface in IMOD. SerialEM can also acquire energy filtered images through a Gatan Imaging Filter (GIF) or a JEOL omega filter. It implements several features to make the GIF more convenient to use, such as automatic switching between regular magnifications with the viewing screen down and the EFTEM lens series needed to use the GIF with the screen up. Both low dose mode and montaging can be used with the filtering. The program supports imaging and tilt series acquisition in STEM mode. There is a Navigator window that allows one to store and return to specimen positions, make low-magnification maps, mark positions on maps, return to marked positions reliably, and automatically acquire images, tilt series, or montages at a series of positions. The program has a scripting capability (called macros) that includes variables, simple arithmetic statements, looping, and conditional statements. It is most commonly used to acquiring images automatically for single-particle reconstruction; some macros are available for this purpose. The macro capability also provides a relatively easy way to add commands requested by users for specialized or experimental use. The operation and configuration of SerialEM is completely documented in a a Windows compiled HTML help file which you can download and view after unzipping on any Windows machine. In addition, you can access the help in HTML format for either the current stable release version or the development version of SerialEM. These on-line HTML files are continually updated for the development version and will often show features that are not in the current release version. There is also a pdf file of the help, although this is only rarely updated (last update July 22, 2015). There are many other improvements; see the list of notable features to learn about them. SerialEM works on modern Thermo Fisher (FEI) microscopes (Tecnai, Titan, Spirit, Talos, Glacios), JEOL microscopes with the TEMCON interface (e.g., 1400, 2100, 2200, 2500, 2800, 3100, 3200, ARM200, CryoARM), and the Hitachi HT7700 and HT7800. The program is built and tested primarily with the version 2 of Titan but it still works on Tecnais under Windows 2000. SerialEM works with CCD or CMOS cameras from Gatan, TVIPS (Tietz Video and Image Processing Systems), Thermo Fisher, AMT, DirectElectron, and EMSIS (formerly OSIS, Olympus Soft Imaging Solutions); it also supports the JEOL Ruby camera. Direct detection cameras from Gatan, Thermo Fisher, and DirectElectron are supported. All EMSIS cameras now work through a plugin available from EMSIS for either 32- or 64-bit versions. STEM acquisition is supported from Gatan's DigiScan, Thermo Fisher's STEM imaging, and the JEOL STEM on the 1400 series. SerialEM cannot control frame-saving from Falcon 3 cameras without a new "advanced" scripting interface. This interface is not being provided for Tecnai/Polara microscopes. Contact Thermo Fisher for details, including whether a license will be needed and how to obtain it. Status of K3 Camera Support: SerialEM's remaining issues with the K3 camera are listed in Remaining Problems with the K3. If necessary or advantageous, SerialEM can be run on a separate computer and control the microscope over the network. Such a configuration is standard on JEOL microscopes, is quite common when using K2 and DE cameras on Thermo Fisher microscopes, and is also possible for Hitachi microscopes. Version 3.5 of the program can access Gatan, Direct Electron, Thermo Fisher, and JEOL Ruby cameras over the network from another computer, and version 3.6 can access Tietz cameras remotely as well, but for other kinds of cameras, SerialEM must run on the computer that hosts the camera. Locate and run the "Delphi Scripting Exampler". For Tecnais through version 3 and possibly on older Titans, this is available through the Start menu under Programs - Tecnai. For Tecnai version 4 and newer Titan software, it is under Programs - FEI Company - TEM Software. Select the "Projection" tab after the program starts. Press the arrow next to "Magnification". If a magnification appears, you have the adapter; if not, there will be an error message in the status bar at the bottom of the window. Although SerialEM itself is open source, the microscope plugins and some camera plugins in this software are provided free for non-commercial purposes. By downloading the distributed software, you agree that you will use it for research rather than commercial purposes, and that you will not distribute it outside of your own institution. The program has been installed on over 300 Thermo Fisher and 200 JEOL microscopes. Program and configuration files are available on the Download and Installation page. Follow the instructions in there to get started. As a first step, it is highly recommended that you fill out the questionnaire in Word doc form and send it to serialemsupport@colorado.edu; we will prepare an initial configuration file. Installations on new JEOL microscopes are usually done with the assistance of Jaap Brink from JEOL, so he should be contacted in those cases (jbrink at jeol dot com). Send all problem reports and requests to serialemsupport@colorado.edu. This is a private email address, not a mailing list. Guenter Resch is now the primary contact for getting assistance with SerialEM. He will collect needed information about a problem, and handle most problems with use of the program. Problems in the program itself will be handled by David Mastronarde. A saved log if it might contain relevant information, especially the log after a crash. When the program crashes, it saves to the log file if one was defined, otherwise to a file SerialEMcrash.log (or SerialEMcrash1.log, etc), typically in the directory where the initial settings file was located. The type of microscope and its location (city, institution, and laboratory). The type of camera being used when the problem occurred. The exact version of SerialEM, including whether it is 32- or 64-bit, and for a beta version, the build date. This information appears at the start of the log when the program starts, and as of SerialEM 3.7 it is in the crash message. SerialEM properties and calibrations (SerialEMproperties.txt and SerialEMcalibrations.txt, typically found in C:\ProgramData\SerialEM or C:\Program Files\SerialEM). Also describe which directory the files came from. Whether you tried any of the relevant troubleshooting procedures described in the SerialEM help, and if so which ones. If the program hangs, for how long did you let it sit before killing it? Do not reply to a previous message from the SerialEM list or one of us; start a fresh message with its own title line. Report one issue per email unless there is some apparent relationship between the issues. Crash: the program closes, generally after an uninformative error message from SerialEM and/or Windows. Hang: the program becomes unresponsive and has to be closed with Task Manager. Bad state: the program interface is responsive but many operations are grayed out and pushing STOP does not restore it. The SerialEM discussion group provides a means for users and people managing the program to ask questions and share their experiences, as well as a way to receive notification of new releases and other news. Digests and posting via email (i.e. list server functionality) are provided. Additional capabilities, including browsable / searchable archives are available through a web interface. Access to the web interface requires a Google login profile, which must be associated with the email address at which you wish to be contacted. (Non Gmail addresses can be used with a Google login, with or without a Gmail address. See the Email section of your Google Account settings). The postings are not moderated, but joining requires approval. asking to be added to the SerialEM list, and you will be added manually. Be sure that this email is sent from the same address as you would use to post to the list. To cancel your subscription, use the web interface or send an email to serialem+unsubscribe@g.colorado.edu. When replying to a previous posting via email, you will have the option to reply to the sender or to the list. A standalone copy of 3dmod and associated files that can be run on Windows without installing IMOD or Cygwin is available here. The package unpacks to C:\Program Files\3dmod and a shortcut can be set up to run 3dmod from there. The package also includes midas, which can be useful to have on the microscope for checking rotations between magnifications. A repository for contributed scripts (macros) was developed by Guenter Resch from Nexperion and is hosted on the Nexperion site. If you have scripts that may be useful to others, please consider adding them to the repository. Daniel Caujolle-Bert at the University of Basel has written a program for managing user and settings and scripts in an environment where multiple users share the same login; it is available here. Our YouTube channel has a series of videos of the lectures on SerialEM presented in a webinar in September 2012, plus some tutorial videos prepared by Cindi Schwartz. The videos are also available right here; if you sort on the "Last modified" column they will be in a good order for viewing. Here are some training documents written by Cindi Schwartz, to provide concrete guidance for doing room temperature and cryo tomography. Here are Powerpoint presentations from a workshop on SerialEM given in December 2006. The slides have a lot of words, but there are many fewer words than in the help manual, so they may be helpful by highlighting the most important points. pdf file of help (last updated 7/22/15). Both SerialEM and the SerialEMCCD plugin to DigitalMicrograph are open source; SerialEM under an MIT license, and SerialEMCCD under the GPL version 2. You can browse the SerialEM source here and SerialEMCCD source here, or you can download either repository with Mercurial. See the IMOD source instructions for setting up Mercurial and updating a repository. This SerialEM repository has been pruned of all changes before Feb. 17, 2017 so as not to disclose calls to proprietary microscope and camera interfaces. However, it is updated nightly from the main development repository, with changes committed with the original comments.